Star Wars Candy Bowls: Let Darth Hold Your Skittles! | Nerd Much? Star Wars Candy Bowls: Let Darth Hold Your Skittles! There’s something seemingly ironic about having a Darth Vader candy bowl hold your skittles. It’s like, the dark side meets the rainbow, which is sort of an oxymoron. Now, this oxymoron can be brought right to your upcoming Halloween party with the Star Wars Candy Bowls. 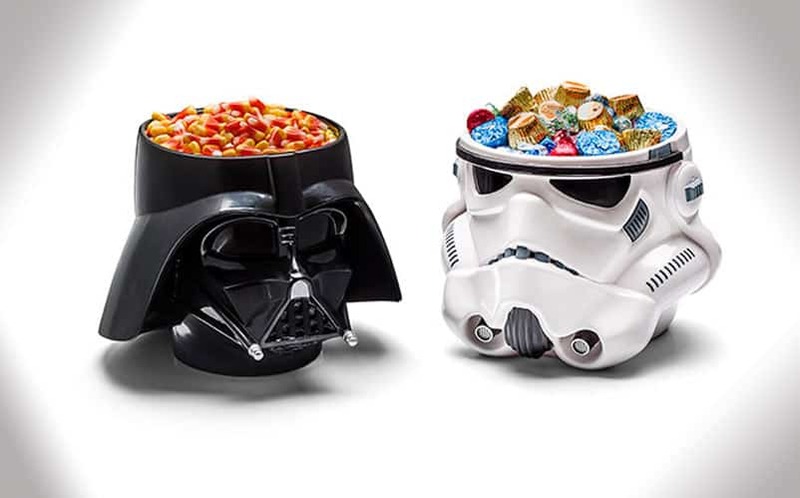 These Star Wars Candy Bowls come in a Darth Vader version or Stormtrooper version. Each bowl holds a bag of whatever your favorite candy is (Gobstoppers or GTFO!). Now I’m picturing Darth Vader sitting around eating his own bag of Tootsie Rolls. Not the chocolate ones, but the colorful flavored Tootsie Rolls. Ha! These bowls are not only great as a Halloween party idea, but they’re also perfect for keeping next to the couch for movie night marathons, like the one you’ll undoubtedly have soon to binge watching the entire collection of Star Wars movies before The Force Awakens comes out. They’ll also make a sweet addition to your nerdy kitchen. For more cool Star Wars stuff, stay tuned to Nerd Much.